Helene Bertha Amalie "Leni" Riefenstahl (August 22, 1902 – September 8, 2003) was an accomplished but controversial German film maker. She was also a dancer and actress, but it was her pioneering film production and photographic techniques which brought her lasting fame. 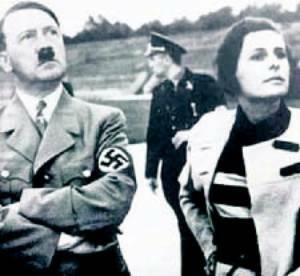 Although Riefenstahl produced significant work long after Hitler’s fall, her reputation had been irreparably damaged and she never again met with the same type of success. Today, despite understandable revulsion at the thought of Riefenstahl’s friendship with Hitler and her support of Nazi Germany, film historians agree that she was an outstanding innovator. Riefenstahl died at the age of 101. Today, she is mainly remembered for her support of the Third Reich and in particular her propaganda films such as the Nuremberg trilogy, of which Triumph of the Will is the best known, and Olympia in promotion of the Berlin Olympics. One especially beautiful film sequence involves divers. Their dives are captured in skillful film that makes the men appear to be flying before plunging towards the water. Interestingly, though Olympia was supposed to document the achievements of the “master race” at the games dubbed “Hitler’s Olympics”, in one sequence Riefenstahl captured the look on Hitler’s face when American sprinter Jesse Owens, an African-American, won a gold medal, and her film did highlight the accomplishments of other non-"Aryans" as well. Albert Speer said she was in frequent conflict with the "antifemininist" party organization that "could hardly brook this self-assured woman." After the first Nuremberg Party Rally film, her talent silenced the critics. Quite relaxed, Hitler spoke of his private life and of things that particularly interested him. Foremost among them were architecture and music — he spoke of Wagner, King Ludwig, and Bayreuth. After he had talked of them for a while, his expression and voice suddenly changed. Fervently, he said "But what fulfills me more than anything else is my political mission. I feel it is my vocation to save Germany — I cannot and may not evade it"...It was dark, and I could no longer see the men behind us. After a long pause he came to a halt, gave me a lingering look, slowly put his arms around me, and drew me to him....He looked at me excitedly When he saw how averse I was he at once let go of me. He turned away a little. Then I saw him raise his hands and say imploringly, "I cannot love any women until I have completed my task." This page was last modified 02:09, 29 December 2010.